First, you eat a carb heavy breakfast. (BAGEL, OATMEAL, TOAST, CEREAL, JUICE, PASTRY…)→ your body gets a sugar load (that’s what carbs convert into once you digest them) so your body produces INSULIN in response to the spike in your blood sugar (Insulin stimulates the cells throughout your body to take in glucose from your bloodstream. Your cells then use glucose as energy, and excess is stored –AS FAT), your blood sugar drops, and then your body feels hungry, stressed and your cravings kick in, probably only 1-2 short hours after you ate! So… often you are so hungry you EAT MORE and the cycle starts again! If you decrease the carbs, increase the FAT, and add a protein, it won’t do that! This cycle is killing us. Literally. Increased insulin increases inflammation, raises triglyceride levels and messes with our hormones. As if weight gain wasn’t bad enough! How to break the “carb-insulin-store fat” cycle? Bacon and eggs — yes, we were brainwashed, eating bacon and eggs gives you protein for fuel and fat for satiety, and doesn’t raise your insulin levels! Hard boiled eggs with berries – I keep hard boiled eggs in our frig. They are a quick snack too. Baked tomato with fried eggs. Or roasted zucchini circles with scrambled eggs. Smoothies made with coconut, almond, cashew milk and frozen fruit and chia seeds. Here’s a recipe. A couple of my almond flour pancakes (no syrup!) with ham or bacon. Make Ahead Mexican Breakfast Casserole — Here’s a recipe. On the run? grab some low carb granola, (just a tiny amount) with grass fed yogurt, like Icelandic (15 grams protien!!). Here’s my granola recipe. 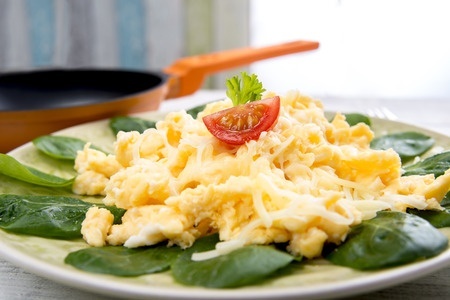 Give low carb breakfasts a try! I’ll try and post more, and please share what works for you, I’d really like to know. We are big on either smoothies–made with whole milk (all other types, 2%, skim, etc. are thickened with fillers) or orange juice (only half, the other with water as OJ is FULL of sugar) frozen berries, a high protein-protein powder, cinnamon, flax seeds, and some ginger if the mood hits. I make eggs, toast and for sure we have a glass of my canned tomato juice. Not bacon very often, lots of fat, but we do have it as fat is not the bad guy. Good Lord, we LOVE bacon. Dang! I was raised, you know how crazy I am about my mom, on a cereal breakfast diet and later the famous (this will date me) Carnation Instant Breakfast stuff. But, to your very wonderful point, having a high carb breakfast does set you up for that crash and it usually hits right before lunch. Now how frustrating is that? Thank you for this and all your wonderful insights. Yep! One of my next posts will be about the sugar in juice! I remember Carnation Instant Breakfast. We have to get our minds wrapped around the concept that fat is ok, in fact, it is necessary to wellness! Bacon is ok!! (not every morning, but definitely once in awhile) — Thanks!